Daniel Findlay has delivered a startling young adult novel set in a post-apocalyptic Australian outback. It brings to prominence a child-to-teen female protagonist who rises from a position of vulnerability to grit. Year of the Orphan is staggering in its complexity, stimulating in its dialect, unsettling in its brutality. When the orphan, who remains nameless, loses her mother and brother to the ghostmen—bludthings—she finds herself up on the slavers’ block, sold in batter trade by scavengers (scavs) for a pittance. She slogs for her master who we only get to know as the “old fella.” Toiling under the custody of fellow slave Karra, who the “old fella” has placed in charge, Orphan swiftly learns to survive the savage conditions of The System—a walled habitat that barricades inhabitants from a barren country, rancorous cannibals and fetid slayers that know no clemency. In this formidable world, it doesn’t take long for the defenceless orphan to fathom that supervisor Karra has his own ambitions, and master “old fella” has more than a few secrets to share. The characters are robust, and you cannot help but champion for the likes of Orphan (waiflike yet valiant), Block (rough yet intuitive) and “old fella” (outwardly a stone yet inside a cushion). But abhor you must the likes of Karra, covetous, crafty and cruel. In the husks of this lost world, somewhere out yonder, is the Reckoner, a shadowy fella who takes vengeance on the scavs—the reckoning is at hand—and who seemingly salvages Orphan from dire straits. 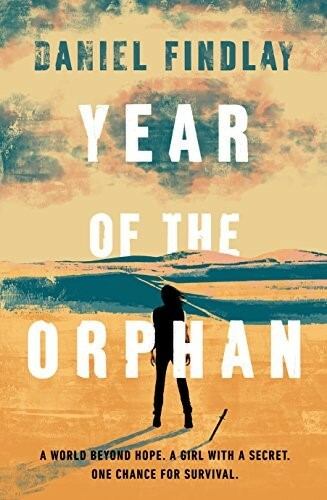 Year of the Orphan is a story of predators: beast and human. Its core theme, an effective one at that, is the fortitude of a female child in a place where grown males falter. Findlay offers a story of survival in a world outside hope. We see the effects of manmade ruin on the land; waste that poisons people and seeps along a terrible sickness. It is a story of courage and friendship, a kind of humanity that survives tribulation. The story borrows from history, casting a long, hard gaze at Maralinga, a true 1950s nuclear testing site. The author captures well the firsthand devastation that happened because of atomic waste in the remote western area of South Australia, home of the Maralinga Tjarutja, a southern Pitjantjatjara Indigenous Australian people. The narrative paints a story where language is power: there is the language of the hands, and the language of letters, and the language of beasts that Orphan masters. The narrative tosses up a world where water is power: slavers use it to manipulate the youngens, easy pickings mostly orphaned. There are no fair ways. Were a day. Were just a day. Up at dawn an the three of em headed to the gully. Check the traps, see if any lizards or coneys had forgot their lernings an got strung up. Walking always walkin. Mam an Jon with damp cloth over their mouths and she got the proper mask being the little one. Kept dust out some but she still spat pale red. Pace, suspense and action propel the narrative. The story vacillates between past and present, flits between point of view—who’s telling the story now? In this anarchist world, a power struggle ensues, but does the winner take all? We find strong world building: grim dusty stacks, old water towers, half-fallen barracks, crumbling stairs, naked concrete channels leading nowhere… Smoke and dust and wind in swirling clouds… Sand-blasted terrain speckled with sun-bleached bones… Powerful imagery vividly carries the narrative from start to finish. Potential for improvement: the writing is prone to much narration. You let out a bellow of relief, if not exhilaration, when the story breaks into a scatter of dialogue that is taut and fetching. Lumps of monolithic text demand your focus, but Year of the Orphan is a story that grows on you. The omniscient narrator offers a telling that is sad, intense and savage. Findlay’s debut novel is home-grown dystopia that is both haunting and vicious. You connect with its characters and see skulls on the dust. You follow the bones, shards of white sticking out of the sand. You stop dead and feel nothing but the “big reaching,” a creeping vastness. And then you smell the beast of the wilderness—its odour of rot, carrion and bad blud. You give way to terror and know there is no escaping; can The System and its orphans survive? Most unique, a titillating read.